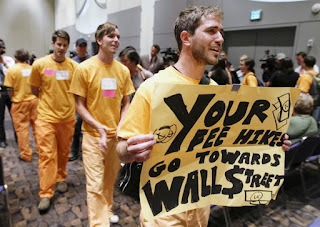 Photo at left was taken in the UC Regents meeting May 16, 2012. On the audio linked below, you can hear them singing "working on a chain gang." The larger issue covered by this and related posts is that privatization often, or even generally, costs more money than it brings in. Privatization is not intrinsically efficient. It builds in administrative and complexity costs, it has new control and audit costs, and above all it has profit costs: the entity providing the funds or services for which the state used to pay directly now takes a piece of the action. The Master Plan for Higher education (link at bottom) was not a text of democratic educational philosophy, but an attempt to wring complexity and competition out of the state system. Privatization puts complexity and competition back in, and encourages not only initiative but imitation and duplication, as exhibited by the desperate Berkeley plan for 10 new campus boards of regents oriented around local revenue enhancement. Studies repeatedly show that initiative comes from intrinsic non-monetary motivations, cooperative rivalries, larger goals, none of which require privatization. There is a large and growing literature about why the privatization of public goods reduces access (drinking water, electricity, education) and raises costs. There are also major, constitutive declines in forms of accountability based in public law. And there are major financial problems. Much evidence comes from Britain, which two decades ago created a Private Finance Initiative (PFI) program to hire private firms to build and operate public works. Major public infrastructure was privatized with all the usual blanket statements about the superior efficiency of the private sector and the society-building effects of the untrammeled profit motive. A HM Treasury Select Committee report last year "concluded PFI deals offer “poor value for money” and can typically cost up to 40 per cent more than if they had been funded with normal public borrowing." Although an aide to the current Conservative Chancellor of the Exchequer George Osborne observed, “We have been saying for a long time that the PFI system we inherited was completely discredited and nothing more than a ploy to keep expensive projects off the balance sheet," they turned around and "reformed" higher education in a way that will pump up a PFI-style student loan system to handle the tripled fees that arose from the 80% public funding cuts. Now the Intergenerational Foundation has released a report called "False Accounting," which shows that the high-tuition plus loans scheme will be more expensive for students and for the goverment. The BBC headlined it as "£9k fees 'to push debt up £100bn' and summarized the problem by citing the report, written by Andrew McGettigan, as showing that the loan scheme produces "a [cost] increase of £5 to 6bn a year and "eclipses" the £3bn savings achieved through the cuts announced to the teaching grant." Cut to California, where the same thing is happening in a different form. The state, via Jerry Brown, is now backing away from demanding that UC use its admittedly reduced public money to focus on its public educational mission. It is moving towards viewing general fund money as a public subsidy for educational activities that will in practice mostly be led by private partnerships. I say this for three reasons (inspired in part by the pithy comment on the neo-compact by the Council of UC Faculty Associations. There are no provisions for enough state funding to fund the relatively expensive combination of high-quality teaching and research that are what we mean by good research university. (I discussed this in Tuesday's post). Savings would come from providing no money for additional state residents. As the state's K-12 population grows, UC would either take the additional students without state funding, as they have often done, or reduce enrollments of state students (as the PPIC report notes). Administration will be one constant scramble for replacement revenues, focusing on self-supported or for-profit auxiliaries, which willy-nilly will become revenue sources for the overall institution. On the first point, the new compact accepts massively reduced state funds ($2 billion below where growth with state personal income would have put it, and about $850 million below costs for next year). In addition, buildings and pensions, once separately funded by the state, would be part of the 4% annual increases (while those costs would grow much faster). On the second point, tuition will continue to rise every year, with 6% as a floor, functioning as did the 7%-10% per year during the Compact with Arnold. Even more fundamentally, the framework would break the contractral link between residential enrollments and funding, separating, as CUCFA points out, the university from the core mission that the public understands and supports. The university would have financial incentives to replace resident with non-resident students, since they will make a large profit on them. And yet the university will never be willing or able to raise tuition fast enough to make up for the inevitable state cuts that will come from actually putting out-of-state students ahead of the children of California taxpayers. The political folly boggles the mind. This brings us to the third point. Without the anchor to the core public mission provided by undergraduate education, the core will be rushed by the auxiliaries who promise large new revenue streams to beleaguered officials. This reverses the Akos Principle in which the auxiliary enterprises are to serve the education core.Tired of austerity and poverty, the faculty will go along. Some of these projects will compete with and replace core revenues, as in UC Online Education (UCOE's) idea of putting lower-division courses, which now offer departments bread-and-butter revenues, on line first, without the departments capturing the full revenues themselves. Others will pull core UC student constituencies into non-UC services, as has been happening with the UC Education Abroad Program, which is required to fund campus study abroad offices that promote non-EAP study programs. A third group will be an expanded version of existing extramural research, which runs large but generally unacknowledged losses. CUCFA mentions capital project costs being subsidized by tuition, and after all the trouble UCOP went to deny the implication of CUCFA president Robert Meister's analysis that UC might not only pledge tuition money for construction bonds but use them to pay them off, it's as if UCOP said "hmm, maybe we should do that after all," and are now negotiating the possibility. But the problem is also there for regular research programs, which are central to the research university mission but not now fully funded, forcing the university to subsidize their indirect costs. As the post-Master Plan UC unfolds, revenue predictions will be overblown, and costs will be higher than expected. In short, many or most of the non-state revenue gushers promised by educational prospectors will, at post-Master Plan UC, be small or negative. To put the point bluntly, post-Master Plan UC is even more likely to demand that budgets drive educational policy, but won't rely on these to actually fix the budget. As is now the case, they will rely on large tuition increases. As a sign of the high-tuition foundation of the whole privatization drift, Moody's Investors Service, the bond rater, has already given a thumbs-up to the Berkeley plan to let many tuition levels bloom. Private partnerships will still generally need public subsidy, and student fees, but without traditional public oversight or justification. So with all this in mind, what happened to the framework at the regents' meeting? I'll cover the framework discussion when I can get the audio, but it Regent Chair Sherry Lansing opened the Regents meeting (SFC coverage here) with the traditional UC offering of thanks to the political powers that have cut higher education more than any other public sector in California, and over the long run more than any other state legislature in the United States. She said (audio via UCLA FA blog), "we are grateful for the treatment of the university in the revised budget that Gov Brown released on Monday. The governor has demonstrated the priority that he has placed on public higher education." Restore the Regents' state allocation request plus $125 million buy out the 6% tuition increase that is coming otherwise. Pass the "Middle Class Scholarship Act" (AB 1500). This would bring the total ask to about $450 M over this year, which gets close to asking for 2/3rds back of last year's cut. By historic UC standards, this is good. But it is still inadequate to the situation. We've had a shortfall in ambition at every point in the crisis (see this post from June 2010). I called for a Real UC budget scenario last week, and I don't see how anything short of that is going to make any difference. On a brighter note, at 68:50 in the audio linked above Provost Pitts offers the Regents about the best 4 minute survey of declining public university educational quality that I have ever heard in an official UC meeting. The crisis is without fail framed under one of two finance models - public and private. The financial lines are not so fine but this is not an inaccurate description. The public financial model is bankrupt, period. The private is, as you have noted, perhaps more expensive, produces HE product of questionable quality and is corruptive of the enterprise social mandate. The general understanding is there is no other option. This is false and the alternative has been staring us in the face for some time. The professional service paradigm and its unique power and finance arrangement is middle ground between public and private HE. Authority and finance is atomized in the professional paradigm (but with a centralized body subject to the will of its membership). This is unlike the institution-centred finance and power structure of the current hybrid institution-government-union paradigm we suffer under. Professions are the stewards of their respective social enterprises and finance (that is the cost and price) are determined closer to the point of service, not closer to Regent Offices or corporate boardrooms. The HE enterprise can and should be converted to the professional paradigm - stewardship without corporate greed and social apathy and a more efficient, effective finance and service model. And because of this and other salient reasons it can produce this improved product at a much cheaper cost. Shawn - thanks for this comment. I am not sure about the formulation "Authority and finance is atomized in the professional paradigm" --I'm looking to reconnect them, as you seem to suggest later-- but like the idea of a professional paradigm as an alternative to the other models. I'm printing out your prospectus for weekend reading . . .
2. Will disruption add technological intermediaries to the existing organizational system, or will there be a new set of organizations. You pick the latter, and I think you're right. 4. funding. I don't think the gov should get out of public education: it's absence converts HE to a private investment, which is not what you want. more work to be done here too. thanks for what you've done so far. This has interesting links with DIY U and some stuff I'm been think about around bootleg universities run by faculty as teaching consultatories (in conjunction with university employment). Your centering it on professional activity is important. The problems in the economy are quite huge. We have lots of people reduced, many long-term loans not paid back, because people are not able to cover such big rates. However I read the story about growing currency, and I can not understand how it could be. In my opinion the time needs some radical steps from the government. However for the ordinary people for the time being I can recommend to read here about short-term loans, that can be very useful in this situation.